*This article was originally written for Parfums Givenchy’s Facebook page. Nicolas Degennes, Make-up and Color Artistic Director of Parfums Givenchy, has been creating colors of Givenchy makeup products and bringing innovative items into the world. He, a French magician of colors, took a trip to Kyoto in search of magicians of colors in Japan. Let us introduce his special trip. 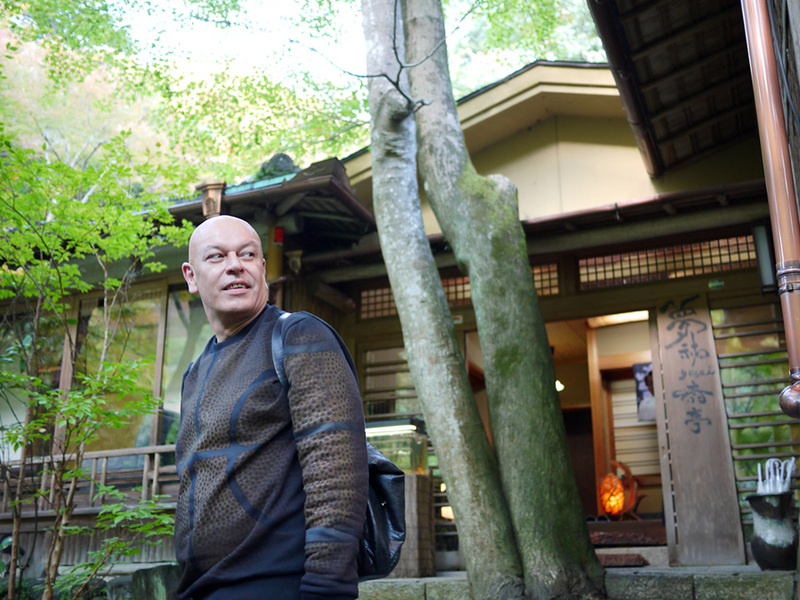 On a crystalline autumn morning in Kyoto, Nicolas visited Imae Senshoku, a traditional dyeing company in the Nishijin Kimono industry, with Julie Coine-Ollivier, President of Parfums Givenchy Japan. Led to a reception room filled with the bright morning sunshine, they talked with representatives from Imae Senshoku over a cup of green tea and Japanese traditional cakes. They enjoyed a conversation about the yarn dyeing and the tradition of Nishijin Kimono, the present and the future of dyeing industry, as well as the world of make-up that Nicolas has been creating. 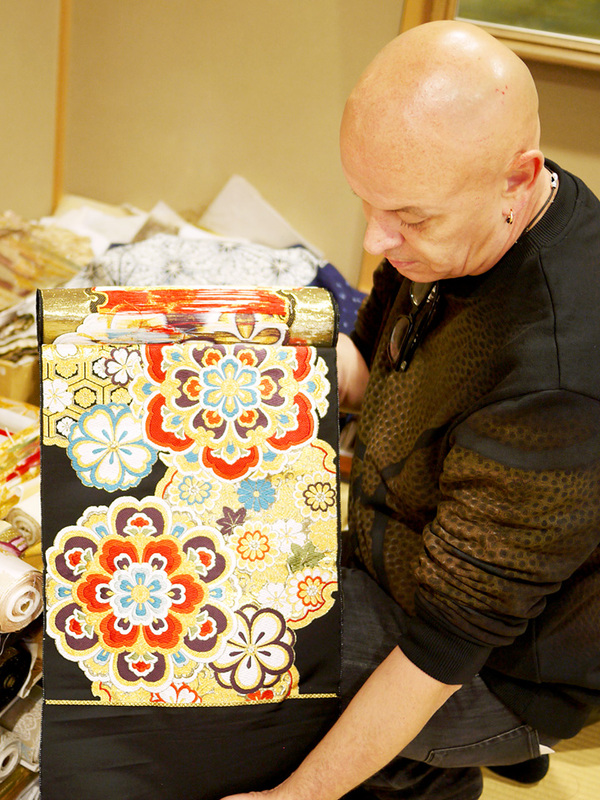 Imae Senshoku showed Nicolas a magnificent collection of Nishijin Kimono fabrics. From classic one with traditional pattern from hundreds years ago to one of modern designs, the piles of multicolored Nishijin Kimono fabrics looked gorgeous as a gold mine. Those words just came out of Nicolas’ mouth. Nicolas was staring at the fabric intently like a child, fascinated by the change of light. In such moments, he might get inspiration for new creations. 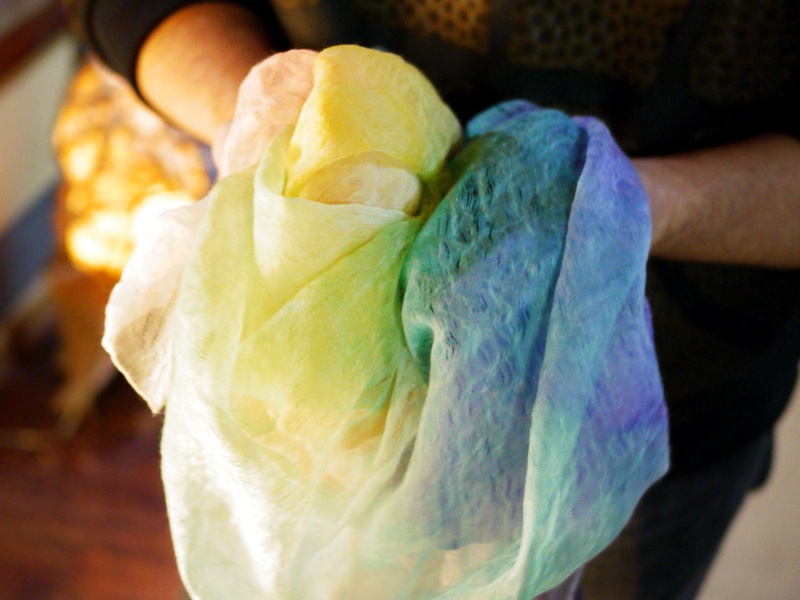 This luminous fabric is the one that Nicolas was fascinated with the most. 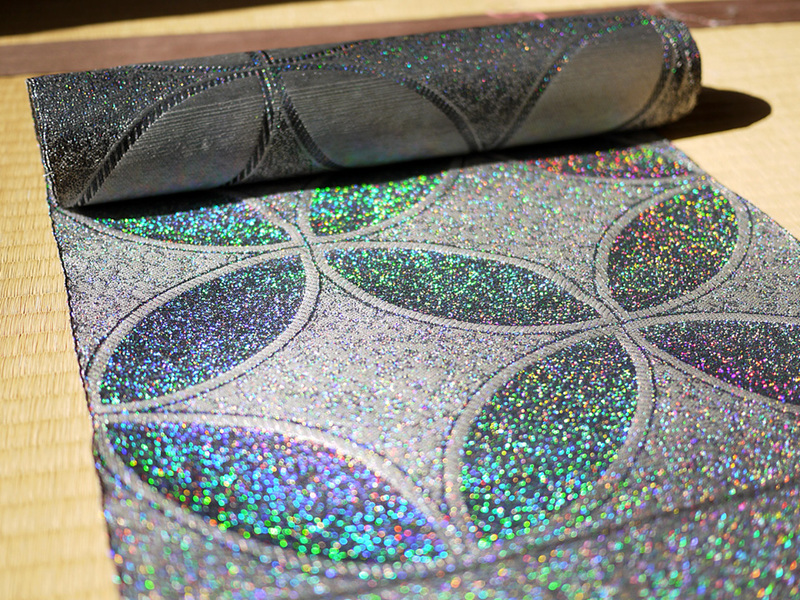 Drawing a modern geometric design with rainbow hologram, its aspect changed like a kaleidoscope against the sunlight. 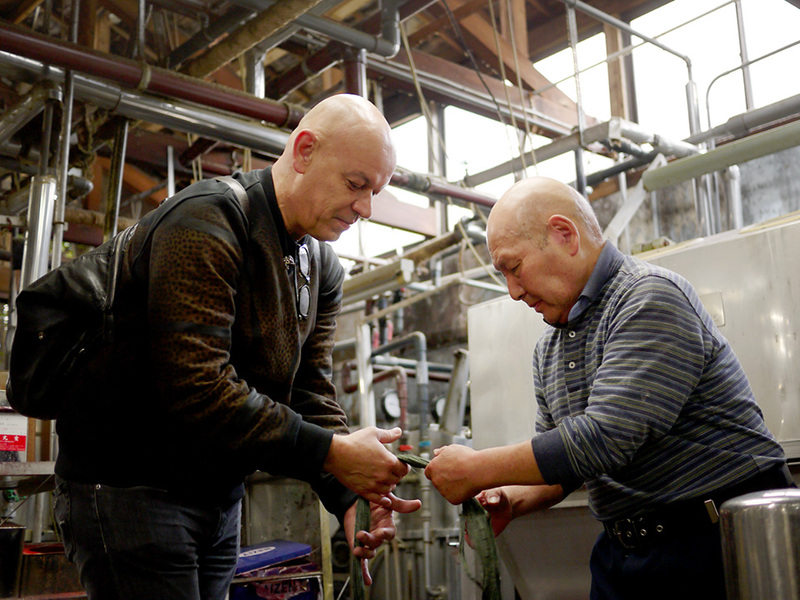 A 80-year-old artisan of Imae Senshoku showed him how to dye yarns. Freshly dyed yarns were steaming. Nicolas was surprised to learn that they usually take orders in the morning, dye yarns and dry them quickly to ship them in the evening of the same day. The 80-year-old artisan gladly responded to Nicolas who asked questions passionately in looking at his work with sparkling eyes. Even though the two spoke in no common language, they instantly attached to each other. 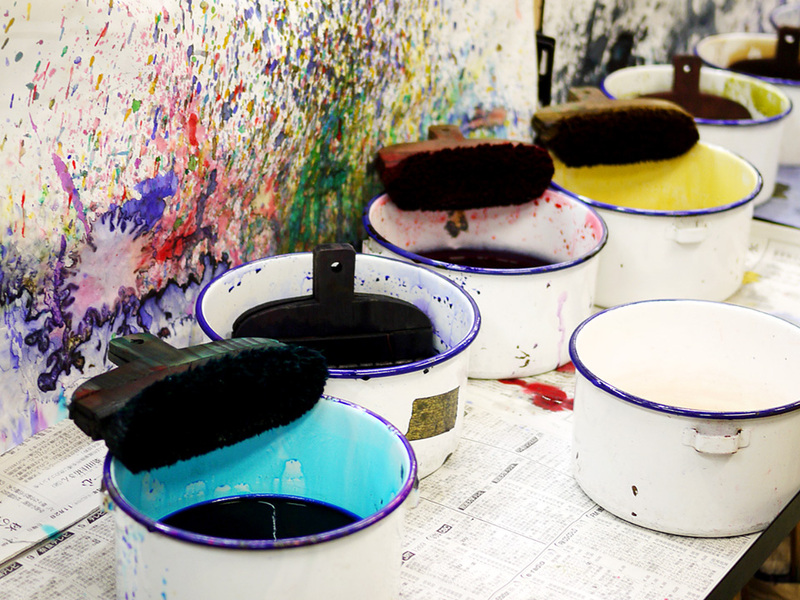 There might be no national or verbal boundary between fellow professionals dealing with colors. The president Mr.Imae was surprised to see the old artisan, who usually keeps quiet, smiled and laughed with the French artist he had just met. Nicolas tried the pigment with great interest on his notebook that he carried around. His daily curiosity and passion are what sustain the creations of Givenchy. Moving from Nishijin district to Arashiyama, Nicolas had lunch at a Japanese restaurant “Tempura Matsu” located by the Katsura River. 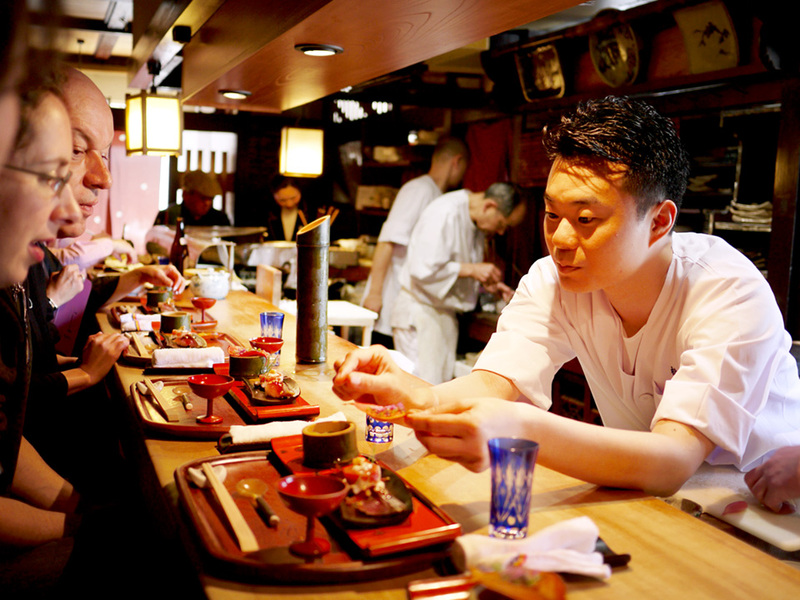 He enjoyed beautiful cuisine of the season served with cold sake in a bamboo bottle. Michelin-starred chef, Alain Ducasse is also one of their regular customers. 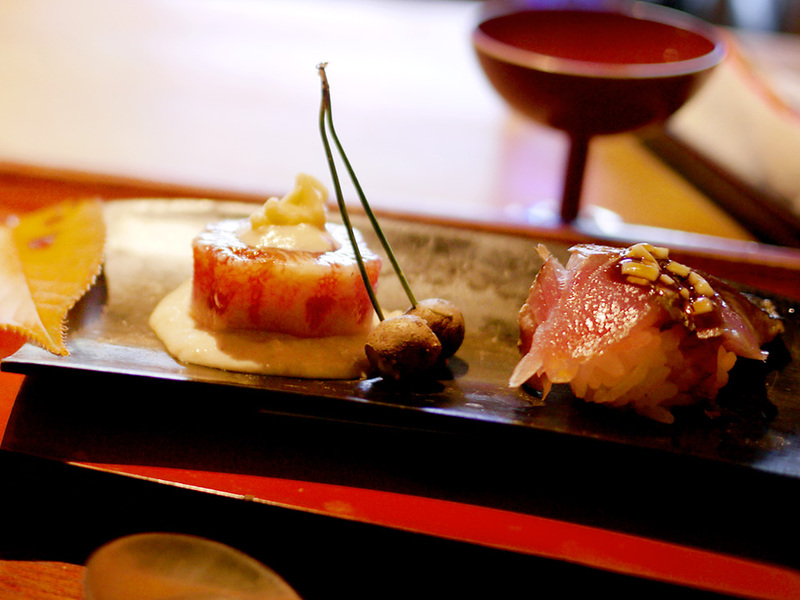 He was deeply impressed by their artistically served cuisine, not only delicious but also amazingly beautiful. Well-versed in ceramic art, they sometimes serve with valuable antique dishes of hundreds years old or ones by great ceramicists such as Rosanjin Kitaoji and Kanjiro Kawai. 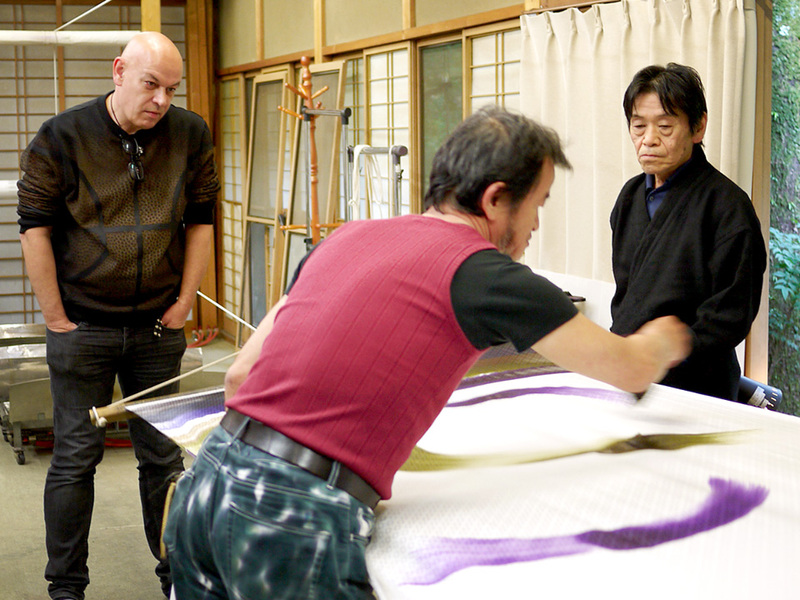 In the afternoon, Nicolas visited the dyeing factory Arashiyama Yusai-tei in scenic Arashiyama area. This atmospheric building with a beautiful view used to be a famous Japanese style named Chidori, where Nobel prized novelist Yasunari Kawabata stayed and wrote a novel “Yama No Oto: The Sound of the Mountain”. 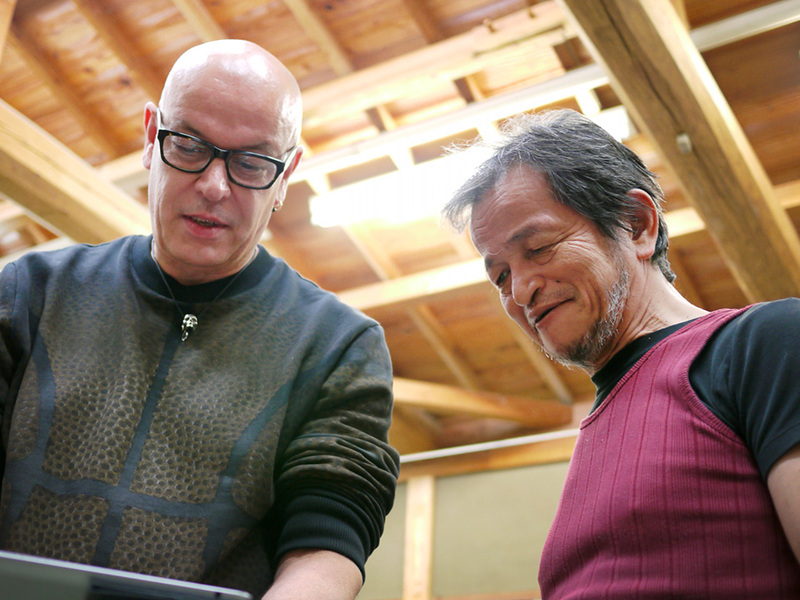 In a room with a view of green woods, Nicolas met a dyeing artist, Yusai Okuda. 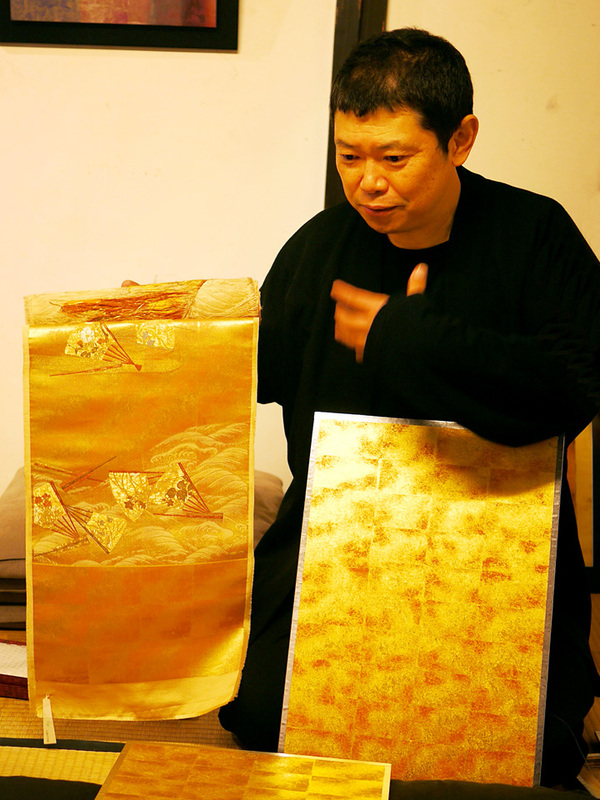 He spoke about his unique dyeing technique “Yume-korozome” which was miraculously developed after researching the “Korozen” dye developed for former emperors, which was shrouded in mystery for very long years. Nicolas got drawn into the mysterious story. When subjected to light, the Yume-korozome dye changes its color dramatically like a magic. 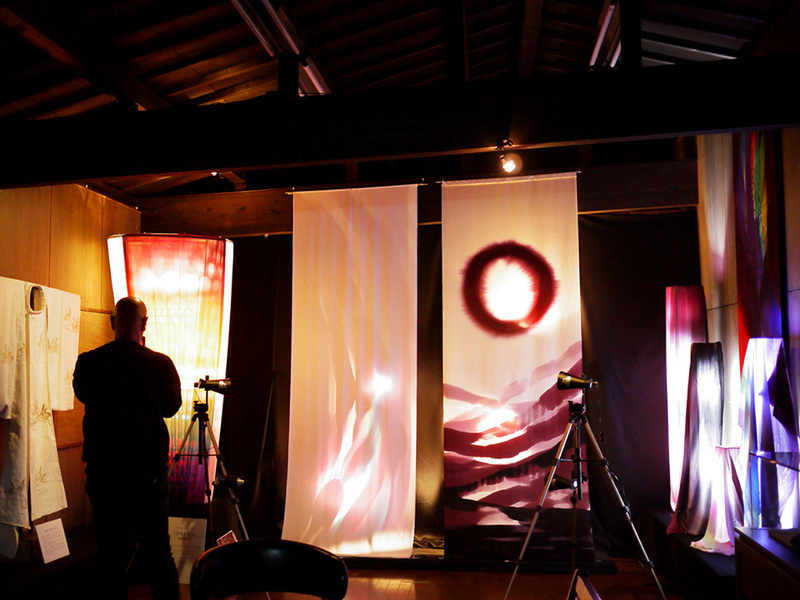 In the gallery, Yusai Okuda’s artworks were illuminated in the darkness and enchanted Nicolas with fantastic scenery. The two big tapestries in the center were exhibited at the Louvre in Paris. A gauzy stole showed a subtle gradation from pale pink to lemon, light green and pale blue when held against the light. “This reminds me of my Prisme! They share something in common,” Nicolas said with amazement. Yusai Okuda gave him a live performance of hand dyeing. Nicolas was fascinated by his brilliant technique, which was just like a live painting performance of contemporary art. 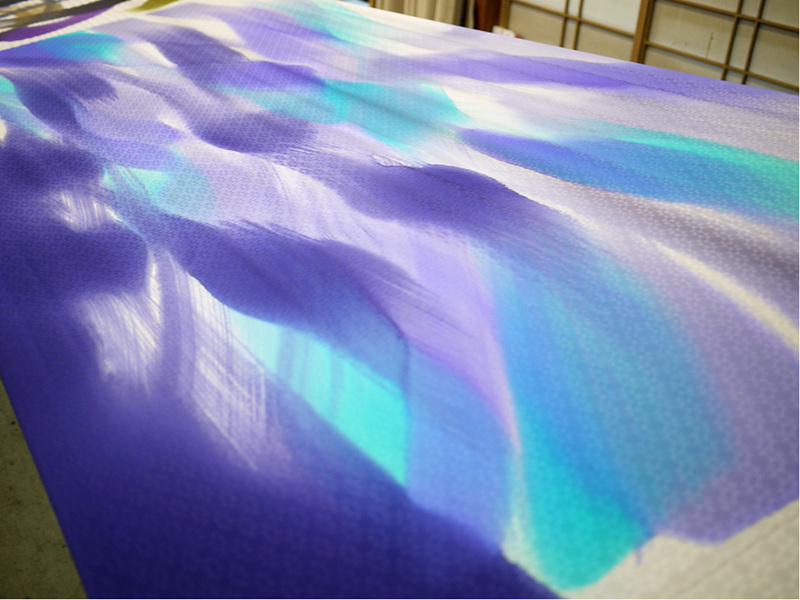 A hand dyeing work by Yusai Okuda, of which brushstrokes flow brightly. Nicolas tried the dye inks of Yume-korozome on his notebook and said, “I’ve never seen a dye like this !” He was surprised to see them keeping colors bright without any interference even if put over a different color immediately. 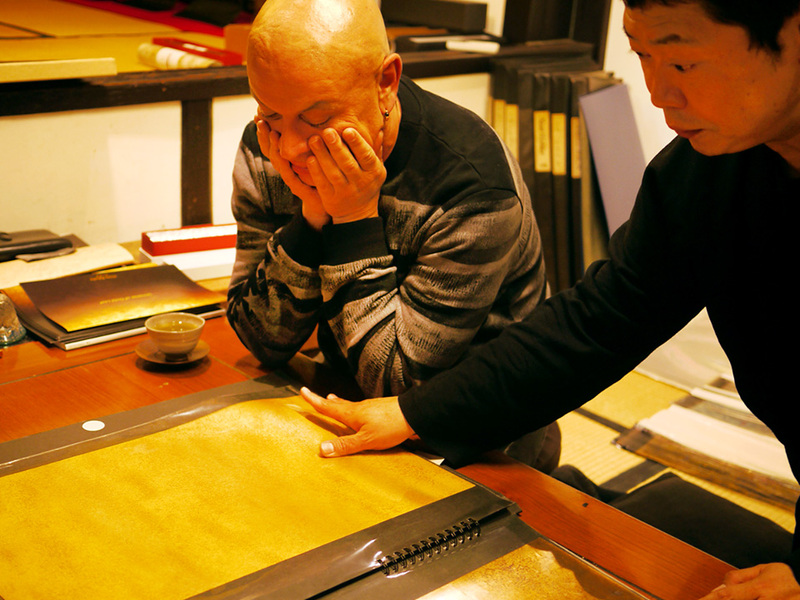 At dusk, Nicolas visited the atelier of Hiroto Rakusho, a master of gold and silver leaf art in the Nishijin district. Hiroto Rakusho has been working to broaden the appeal of metal leaf art developed in Kyoto to other various genres and actively collaborating with artists worldwide. 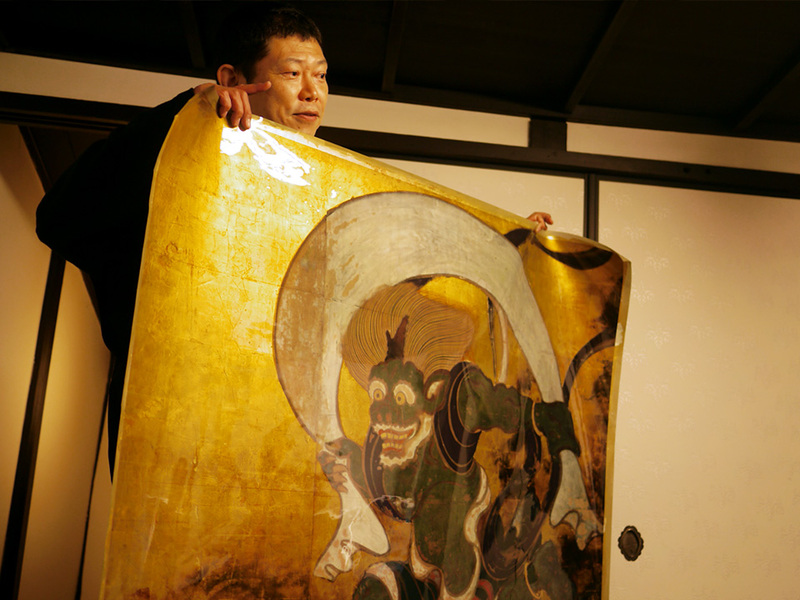 Not only creating artworks as an artist, he is also working to preserve, restore and replicate precious cultural properties stored in museums, shrines and temples in Kyoto, such as the famous “Fujin Raijin Zu: The Wind and Thunder Gods” owned by Kennin-ji Temple. 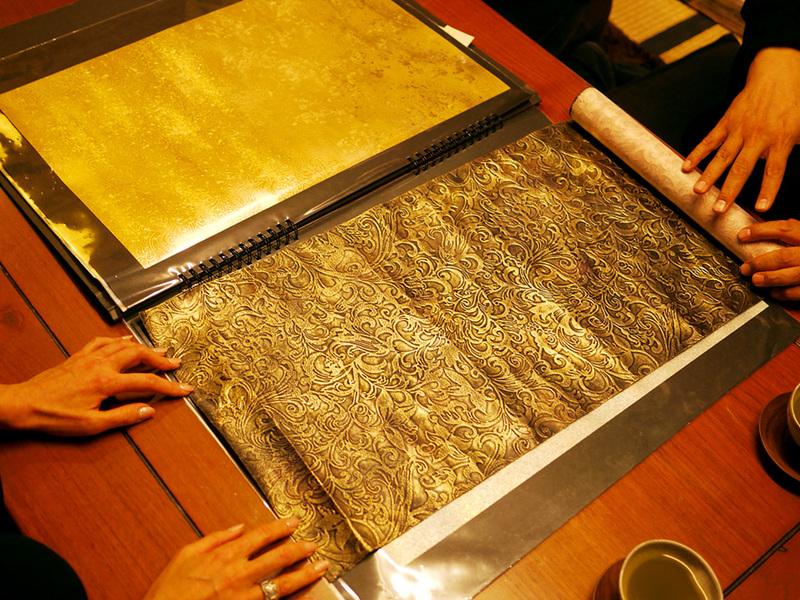 Hiroto Rakusho told us about the charm of gold and silver leaf. Though the metal leaf art seems far from the world of make-up, the two artists found a similarity between the idea of foundation in make-up and of traditional metal leaf, which both intend to lay the groundwork on individual bases to bring out a central element for beauty. Hiroto Rakusho showed us his collection of metal leaf works at his atelier. “Every single piece is a wonderful piece of art,” Nicolas said with admiration. A metal leaf work with embossed effect. 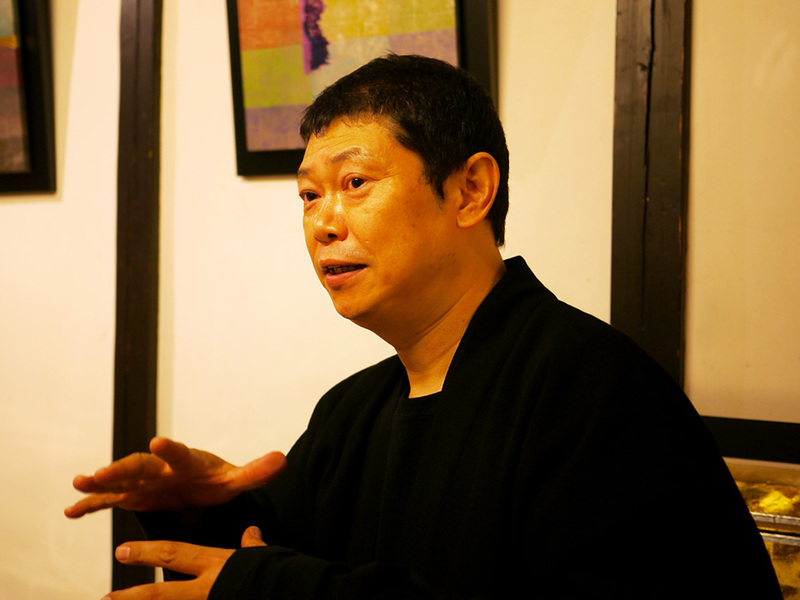 Hiroto Rakusho explained that he can produce various expression with his special technique by heating and then stopping the chemical reaction in which a metal leaf changes from moment to moment. Nicolas was fascinated by the delicate texture and colors of each piece, losing track of time. Surprised with a multifaceted expression of metal leaf art, he seemed to get many new inspirations. 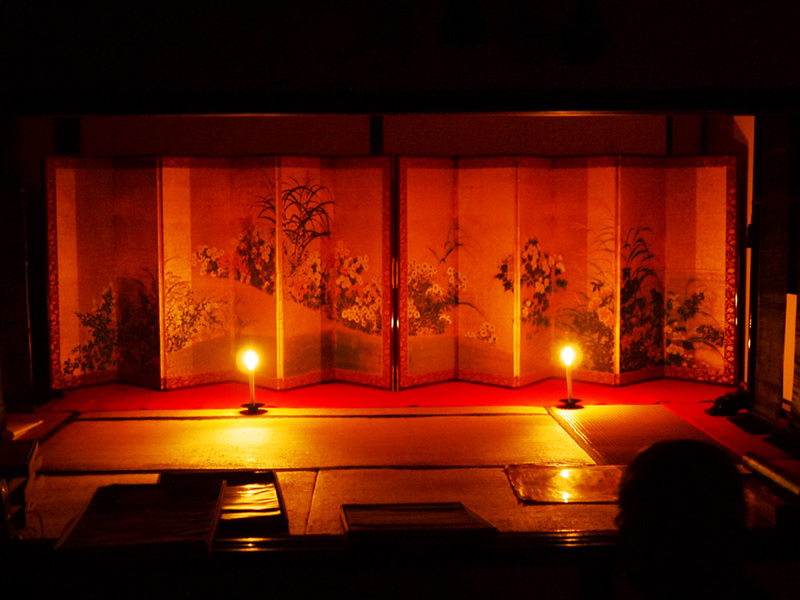 Hiroto Rakusho showed him a gold leaf folding screen in the flickering light of candles. Invited to the subtle world of Japanese light and shadow which Junichiro Tanizaki wrote about in his essay “In Praise of Shadows” in 1933, Nicolas was lost for words, drunk in the beauty. 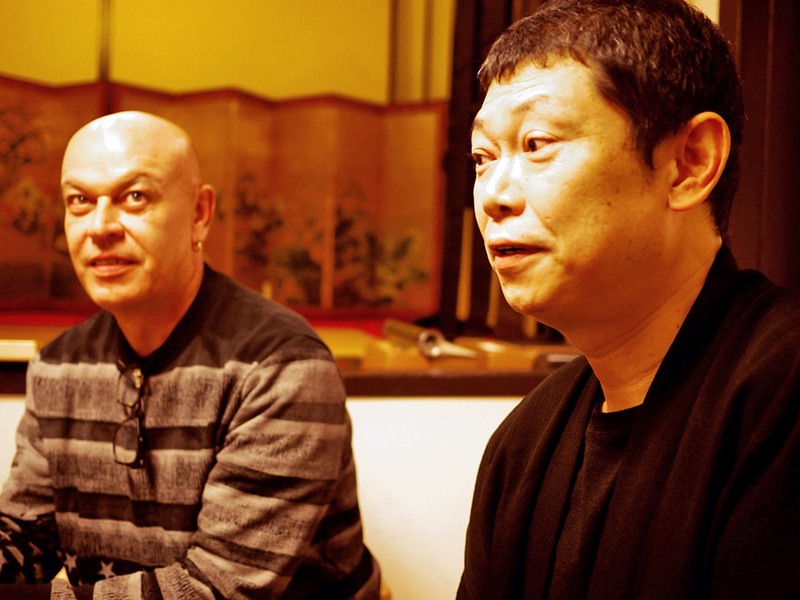 Special thanks to Hiroto Rakusho, who made great efforts to realize this wonderful trip. 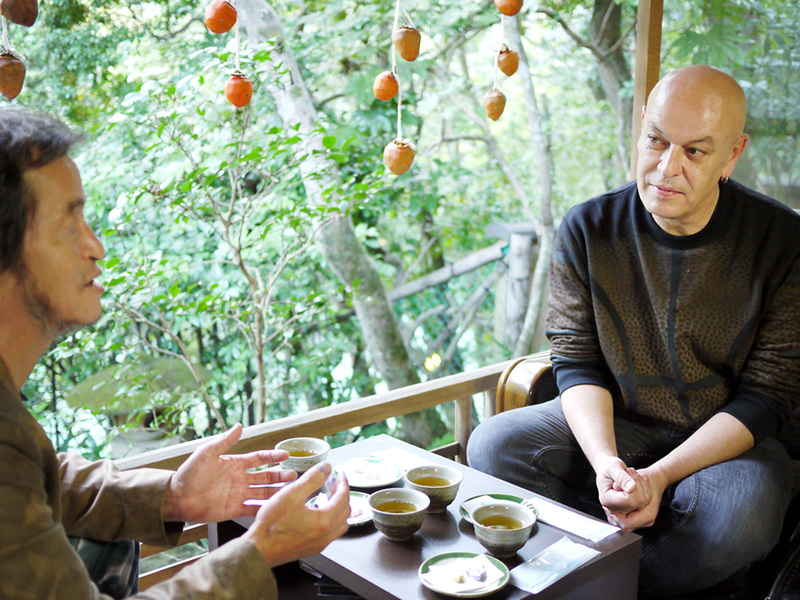 He was very happy that Nicolas, who loves Japan from his heart, met great artists and artisans in Kyoto. The two artists promised to see each other again. 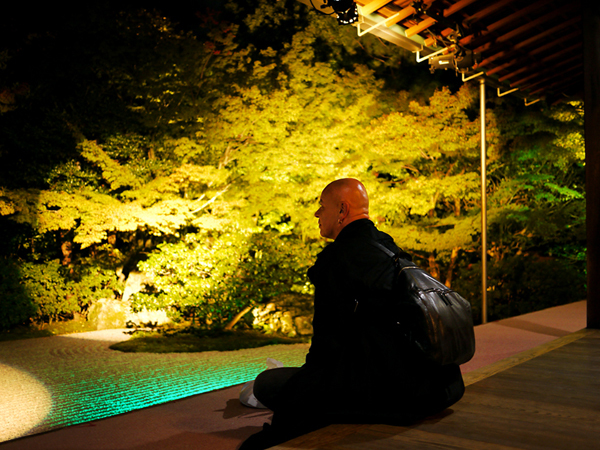 Moved to the Gion district, he visited Entokuin Temple at night. The temple was established in 1606 by Nene, a wife of Hideyoshi Toyotomi regarded as Japan’s second great unifier, where she spent her last years in memory of her husband. 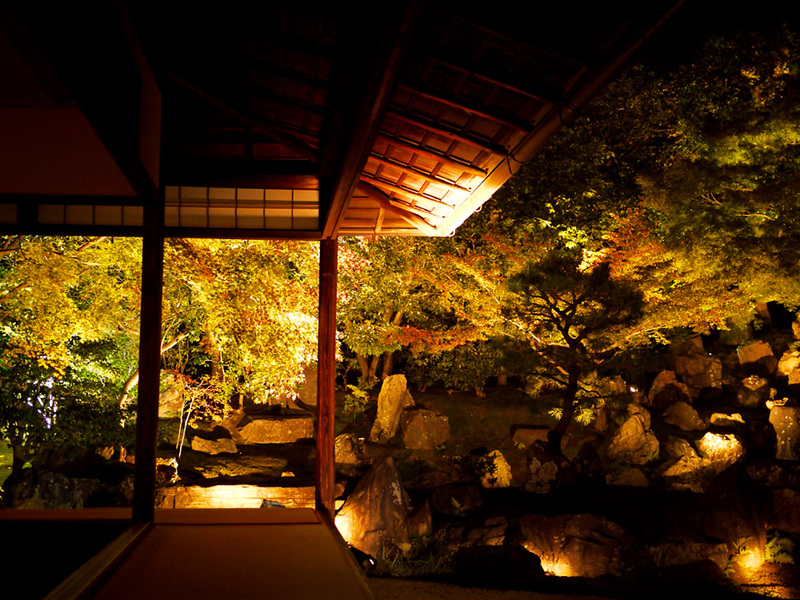 Seeing the beautiful garden with colored leaves and assorted stones, illuminated in the silence of the night, Nicolas was moved to tears. Touched by the beauty, he might have remembered the colors and culture of Japan he had discovered, as well as the wonderful people he had met during the trip.